(AP) RAMAT GAN, Israel - For the past 30 years, Israeli Judaic scholar Menachem Cohen has been on a mission of biblical proportions: Correcting all known textual errors in Jewish scripture to produce a truly definitive edition of the Old Testament. 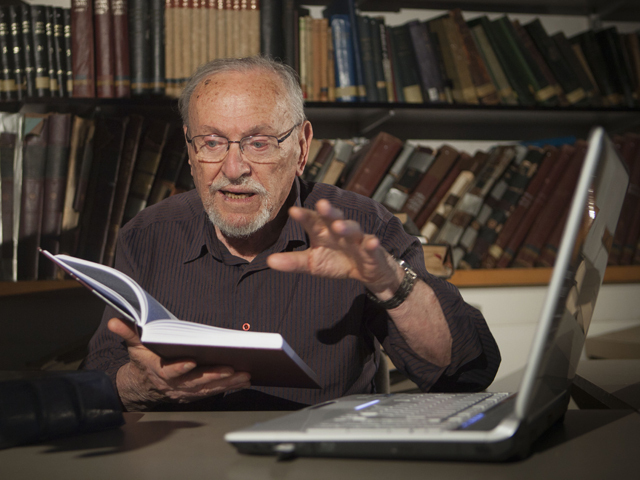 Poring over thousands of medieval manuscripts, the 84-year-old Cohen identified 1,500 inaccuracies in the Hebrew language texts that have been corrected in his completed 21-volume set. The final chapter is set to be published next year. The massive project highlights how Judaism venerates each tiny biblical calligraphic notation as a way of ensuring that communities around the world use precisely the same version of the holy book. According to Jewish law, a Torah scroll is considered void if even a single letter is incorrect or misplaced. Cohen does not call for changes in the writing of the sacred Torah scrolls used in Jewish rites, which would likely set off a firestorm of objection and criticism. Instead, he is aiming for accuracy in versions used for study by the Hebrew-reading masses. For the people of the book, Cohen said, there was no higher calling. "The people of Israel took upon themselves, at least in theory, one version of the Bible, down to its last letter," Cohen said, in his office at Bar-Ilan University near Tel Aviv. The last man to undertake the challenge was Jacob Ben-Hayim, who published the Mikraot Gedolot, or Great Scriptures, in Venice in 1525. His version, which unified the religion's varying texts and commentaries under a single umbrella, has remained the standard for generations, appearing to this day on bookshelves of observant Jews the world over. Since Ben-Hayim had to rely on inferior manuscripts and commentaries, numerous inaccuracies crept in and were magnified in subsequent editions. Most of the errors Cohen found were in the final two thirds of the Hebrew Bible and not in the sacred Torah scrolls, since they do not include vowel markings or cantillation notations. Cohen said unity and accuracy were of particular importance to distinguish the sacred Jewish text from that used by those sects that broke away from Judaism, namely Christians and Samaritans. To achieve his goal, Cohen relied primarily on the Aleppo Codex, the 1,000-year-old parchment text considered to be the most accurate copy of the Bible. For centuries it was guarded in a grotto in the great synagogue of Aleppo, Syria, out of reach of most scholars like Ben-Hayim. In 1947, a Syrian mob burned the synagogue, and the Codex briefly disappeared before most of it was smuggled into Israel a decade later. Now digitized, the Codex, also known as the Crown, provided Cohen with a template from which to work. But because about a third of the Codex  nearly 200 pages  remains missing, Cohen had to recreate the five books of Moses based on trends he observed in the Codex as well as from other sources, such as the 11th-century Leningrad Codex, considered the second-most authoritative version of the Jewish Bible. Cohen also included the most comprehensive commentaries available, most notably that of 11th-century Rabbi Shlomo Yitzhaki, known as Rashi. The result is the completion of Ben-Hayim's work. "It was amazing to me that for 500 years, people didn't sense the errors," said Cohen, who wears a knitted skullcap and a gray goatee. "They just assumed that everything was fine, but in practice everything was not fine." He's not the only scholar to devote decades to the task. In 1976, Rabbi Mordechai Breuer published a version of the Torah based mainly on the Aleppo Codex. The Hebrew University Bible Project in Jerusalem has also been working on a scientific edition of the Hebrew Bible, but theirs is directed toward scholars, while Cohen's output is aimed at wider consumption. Rafael Zer, the project's editorial coordinator, called Cohen's work "quasi-scientific" because it presents a final product and does not provide the reader a way of seeing how it was reached. He credits Cohen for bringing an exact biblical text to the general public but said it "comes at the expense of absolute accuracy and an absolute scientific edition." With the assistance of his son Shmuel, a computer programmer, Cohen launched a digital version he hopes will become a benchmark of the Israeli education system. He said his ultimate goal was to "correct the past and prepare for the future." As a former teacher, Cohen said he took particular pride in a sophisticated search engine that allows even novices to explore his work with ease. He called computers a "third revolution" to affect Jewish scripture, following the shift from scrolls to bound books and the advent of the printing press. "I want the Bible to be user-friendly," said Cohen, a grandfather of eight. "Today, we can create sources of information and searches that allow you to get an answer to everything you are wondering."